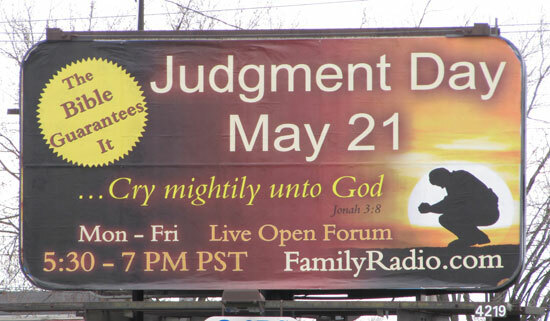 As of writing this article, there are a little over two weeks to go until Judgement* Day - the day when Harold Camping's latest End-of-the-World forecast is judged an abysmal failure. I took the photo below two weeks ago in Welland, Ontario just up the street from the hotel I was staying at. Two things struck me about this particular sign. First of all, unlike most of the photos of other similar billboards across the USA which have appeared on the web, this one lacks a year. It makes me wonder if the Canadian branch of Camping's organization is wisely hedging its bets. The second thing is that guarantee. 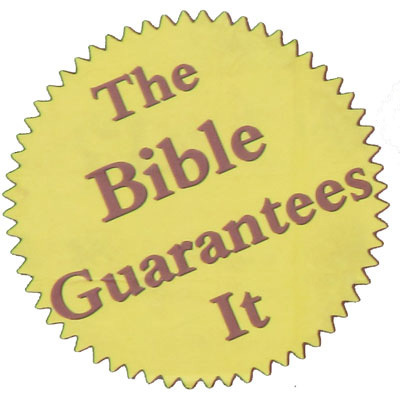 You can tell it is a genuine guarantee because it is printed in a gold seal. Yes! The Bible Guarantees It. But what does this guarantee mean? We know that Camping's previous prediction of 6 September, 1994 failed. That prediction was based on the very same Bible. And what happened? Camping just went ahead made another prediction - and seems to have gathered far more followers as a result. That's what the Bible guarantees... more predictions... more failed predictions. The Bible guarantees that for any future date, it is possible to analyse the Bible and make a flawless prediction that Judgement Day will fall on that specific date. The Bible also guarantees that each and every prediction will fail. For the Bible also states that Judgement Day would fall before the death of some of those who were physically present to hear Jesus speak. Their deaths passed unnoticed nineteen centuries ago. All predictions of Judgement Day can safely be ignored. The Bible Guarantees It. Billboard is at corner of Prince Charles and Lincoln. Really situated badly as it is not in the line of vision while driving, nor even very visible while stopped for traffic lights. I drove past it at least 8 times without seeing it, and only noticed it while walking. I'm quite pleased to say Camping's organization wasted their money on this one. Steal this guarantee seal. Use it liberally - for example, use it as your social networking avatar on the day of any end time prediction. Or any time you need a snarky response to a Bible-thumper. I decided to leave my spelling alone and add this note.